Course held over two separate weekends. More details available in DCC course listing. Whitfield School REGISTER HERE Course held from 9:00am - 1:00pm. Required of all those desiring to coach within the state of Missouri, regardless of any other licensing you may hold from Coerver, NSCAA or any other sanctioning or instructional organization. If you hold ANY USSF A, B, C, D or E license you are considered properly licensed to coach in Missouri Youth Soccer Association club as a coach. To raise the level of coaching and therefore raise the quality of instruction and standard of play within the state of Missouri, Coaching Education and Development is a continuous and ongoing affair. The Youth Coaching Certificate Program (State Coaching School) is part of an overall program designed to instruct and teach soccer coaches so that they will become better informed about not only the game and its finer points but also on the physical requirements, mental requirements, team management aspects, injury care, and prevention as well as understanding the laws of the game. The ultimate goal of this program is to provide the coaching participants with quality information so they, in turn, are able to develop their players to the best of their ability no matter the level of competition or the individuals coaching experience. PLEASE NOTE – In order to register for ANY courses now in the DCC, you must have an ACTIVE DCC PROFILE & must complete the FREE 20 Minute “INTRODUCTION to GRASSROOTS COACHING MODULE” located in the DCC. This will then allow access to register for eligible courses. 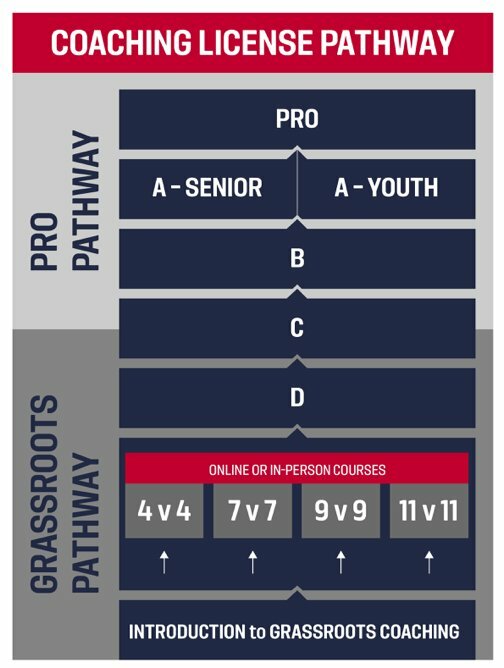 The 4v4 In-Person Course is a four-hour course that builds on the principles covered in U.S. Soccer’s Introduction to Grassroots Coaching Module. Specifically, candidates will learn more about U.S. Soccer’s Grassroots Coaching Education Philosophy, Play-Practice-Play Methodology, the Six Tasks of a Coach, and the characteristics of players aged 6-8. The course will also ask each candidate to reflect on their experiences to develop action steps for personal growth. In order to register for the 4v4 In-Person Course, candidates must have completed U.S. Soccer’s Introduction to Grassroots Coaching module. This module can be accessed here. The 7v7 In-Person Course is a four-hour course that builds on the principles covered in U.S. Soccer’s Introduction to Grassroots Coaching Module. Specifically, candidates will learn more about U.S. Soccer’s Grassroots Coaching Education Philosophy, Play-Practice-Play Methodology, the Six Tasks of a Coach, and the characteristics of players aged 9-10. The course will also ask each candidate to reflect on their experiences to develop action steps for personal growth. In order to register for the 7v7 In-Person Course, candidates must have completed U.S. Soccer’s Introduction to Grassroots Coaching module This module can be accessed here. The 9v9 In-Person Course is a four-hour course that builds on the principles covered in U.S. Soccer’s Introduction to Grassroots Coaching Module. Specifically, candidates will learn more about U.S. Soccer’s Grassroots Coaching Education Philosophy, Play-Practice-Play Methodology, the Six Tasks of a Coach, and the characteristics of players aged 11-12. The course will also ask each candidate to reflect on their experiences to develop action steps for personal growth. In order to register for the 9v9 In-Person Course, candidates must have completed U.S. Soccer’s Introduction to Grassroots Coaching module This module can be accessed here. The 11v11 In-Person Course is a four-hour course that builds on the principles covered in U.S. Soccer’s Introduction to Grassroots Coaching Module. Specifically, candidates will learn more about U.S. Soccer’s Grassroots Coaching Education Philosophy, Play-Practice-Play Methodology, the Six Tasks of a Coach, and the characteristics of players aged 13 and older. The course will also ask each candidate to reflect on their experiences to develop action steps for personal growth. In order to register for the 11v11 In-Person Course, candidates must have completed U.S. Soccer’s Introduction to Grassroots Coaching module. This module can be accessed here. The National D license is a 40 to 45-hour course, held over two weekends, at minimum 4 weeks apart, designed for the grassroots coach who meets the prerequisites outlined below. The focus of this course is to facilitate the improvement of the candidates in the Six Tasks of a Coach across all four game-models (4v4, 7v7, 9v9, 11v11) with a particular emphasis on Coaching Training Sessions. Candidates that register for this course are expected to attend both meetings. If you need a Re-Print of your Missouri Youth Coaching Certificate, you can purchase one HERE.